Photograph from the series 'Forget Your Past' by Nikola Mihov (C). Four speakers will present their views in short lectures; ranging from tantalising artistic research concerning the re-appropriation of socialist monuments in Bulgaria to the significance of this discourse surrounding public monuments in other societies as it pertains to spatial use and re-use. Taking Bulgaria's post-socialist situation as a starting point, this lecture makes the connection to other realities, such as The Netherlands, where the relation between art and politics and art and monuments in the public space will be addressed. In this way, the theme of the exhibition ´Socialism´s Material Residue - legitimacy and (re)appropriation of Bulgaria´s socialist monuments` will be given a broad treatment. Questions that will be addressed are, amongst others: Can the current discussion in Bulgaria regarding the fate of socialist monuments be translated to other social realities and used as a case-study in the discourse surrounding the use and re-use of public art and public space in other societies as well? What meaning can we get from contemporary artworks that deal with re-appropriation and re-use of monuments in the public sphere? If art takes the role of politics, what kind of politics do we want art to take part in? Dr. Joost de Bloois achieved his PhD at the Utrecht University in 2003 and has since then been assistantprofessor at the University of Amsterdam, departments of Comparative Literature and Cultural Analysis. He has published widely on the nexus between art and politics in magazines such as Metropolis M and Simulacrum, as well as publications on the work of philosophers/authors Georges Bataille, Jacques Derrida and essays on the impact of philosopher Gilles Deleuze on the contemporary thinking on art. Lately de Bloois has been working on the work of philosopher Alain Badiou and co-edited (with Ernst van den Hemel) a publication on Badiou Alain Badiou's Inesthetiek: filosofie, kunst, politiek that was published just recently. De Bloois has taken part in public programmes of lectures in reknown institutions such as the Stedelijk Museum Bureau Amsterdam, 2011, and De Appel 2012. De Bloois lives in Utrecht and works in Amsterdam. "For the sake of the poor century which is opening, we must, and thus we will, declare the existence of what no longer exists in art: the monumental construction, the project, the creative force of the weak, the destruction of established powers". Thus writes the French philosopher Alain Badiou in his Manifesto of Affirmationism. In his political philosophy Badiou advocates a renewal of 'communism' (albeit at a distance from 20th century state communism). What can Badiou's peculiar plea for a new monumentalism in art and a new communism in politics mean precisely when communist monuments are left to decay, like so many embarrassing reminders of a failed utopian project? Do not the works exhibited in Socialism's Material Residue precisely demonstrate that, under the rule of triumphant neoliberal capitalism, the socialist monument can only be reduced to a mere historical oddity or, perhaps at best, a kitsch object for hipster art? Starting from Badiou's reflections on the political significance of (contemporary) art, Joost de Bloois will show that the political significance of remaining socialist monuments may well reside in their anachrocity: it is perhaps as a 'vanishing term' that they may indicate to new forms of radical emancipatory politics. Dr. Jeroen Boomgaard is an art historian and art critic, and currently Professor of Art and Public Space at the Gerrit Rietveld Academie, head of Master Artistic Research at the Universiteit vanAmsterdam and also directs the research group Art & Public Space (Lectoraat Kunst en Publieke Ruimte). In his work, Boomgaard examines the role of art in the public domain, and the bridge between art and research. He regularly writes articles about art and public space for publications such as Open. Cahier on Art and the Public Domain. In 2008 he edited a collection of essays on art in public space, High Rise – Common Ground, Art and the Amsterdam Zuidas Area. He also co-edited (with Bart Rutten) the book The Magnetic Era: Video Art in the Netherlands 1970–1985 (2003). In 2011 he published Wild Park: Commissioning the Unexpected with essays on the quality of art inpublic space. Boomgaard examines the role of art in the public domain, and the bridge between art and research. In Boomgaard´s presentation we will see if the current discussion in Bulgaria on the re-use and reappropriation of socialist monuments in a post-socialist era can be translatable to a different reality, The Netherlands for example, where instead of public monuments executed during a period of totalitarian ideology, the effectiveness and role of public art is a more common subject of discussion. Krassimir Terziev (1969 Dobrich, Bulgaria) is a trained painter who also produces photographs, installations and computer mediated works. However, it is the moving image that has proven to be his most expressive artistic idiom. He is acclaimed for his works in experimental film and video art, and is co-director of XFILM festival for Experimental Film, Video & New Media in Sofia. Terziev’s work has been shown on television, media art festivals (Impakt, Utrecht and Video positive, Liverpool), Group shows (NEW VIDEO, NEW EUROPE, Stedelijk Museum, Amsterdam and TATE Modern London & ST. Lois MOCA, etc). Terziev will be showing his video work “MONU-MENTAL” (2011): an observation of a public space that is popular among the youth in Sofia. In his artistic research, Terziev investigates the role of public (urban) space in the cultural and socio-economic practices and structures, and the spatial practices of the inhabitants of the city. Those monumental constructions of the communist era in Bulgaria are usually seen as mute shapes of stone and metal. Directed towards eternity, they are meant to be an expression of common memory, guarded by rigorous rituals. Despite that common notion, after 1989 wesaw them as sources of passionate conflicts, ironic art interventions and political fights. It seems that they died together with the old political system, only to return as undead in various new scenarios full of love and hate. There is a process of reappropriation not only by artists but by various power positions as well: local and central authorities are not less creative in adapting these symbolic sites for the new realities. In Krassimir´s presentation some of the peculiar top-down interventions that he has encountered around the country will be addressed. Nikola Mihov was born in Sofia in 1982. In 2002 he moved to Paris, where he became interested in photography. Since 2006 he has taken part in a number of international exhibitions and festivals. He received the award of the Phodar International Biennial of Photography in Pleven, Bulgaria (2009), and was nominated the “Zooms” award of Salon de la Photo in Paris (2012). Nikola is a co-founder of SOCMUS - the virtual museum of the socialist era graphic design in Bulgaria (www.nikolamihov.com). 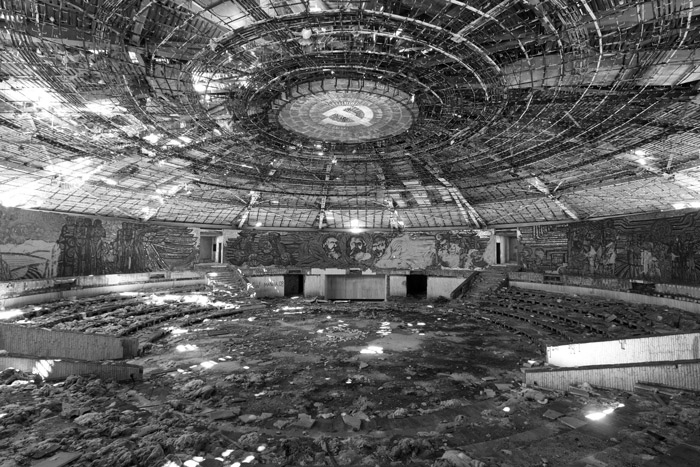 During the last three years, in his photographic series Forget Your Past, Mihov has traced the fate of the most important communist-era monuments in Bulgaria, from their construction to their present state today. Taking his work as the basis for his input, this part will have the character of a case-study.